Ted Lapidus introduced Lapidus in 1987. This fine fragrance contains juniper, basil, lemon and is accented with lily of the valley, thyme and orris. Lapidus is perfect for casual use. everyone i introduce this product to falls in love with it! My husband has been told that he is the best smelling guy at his job. It smells so good it makes you want to keep it a secret. 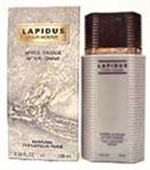 lapidus by ted lapidus is my signature calone i am 41 yrs old and i have been using lapidus since i was 18 yrs i have tried other online shops but to no avail you guys are great and will be my number one place if i need anything else in the future thankyou so much you have made me one very happy man again because i was so worried that i would not be able to use this calone again thanks again ..
One of the best fragrances on the market today. Use it almost everyday, lasts long and have gotten many compliments on it. No need to spend $60 or $70, this is the best value around and you don't have to use a lot to get that aromatic scent.